Multi-talented entertainer Terry Fator welcomed all 53 contestants from the Miss America Pageant organization last night. The lovely ladies were brought onstage during his Terry Fator: The Voice of Entertainment show at The Mirage Hotel & Casino in Las Vegas, Nevada. 2012 MISS UNIVERSE Competition eighty nine contestants graciously put a brush to canvas and completed a work of art to help children who face life threatening medical conditions, under the direction of Rachel Roberts, owner of Las Vegas-based Design & Wine Eat • Drink • Paint. Now the artwork of each contestant is available for sale to successful bidders around the world. 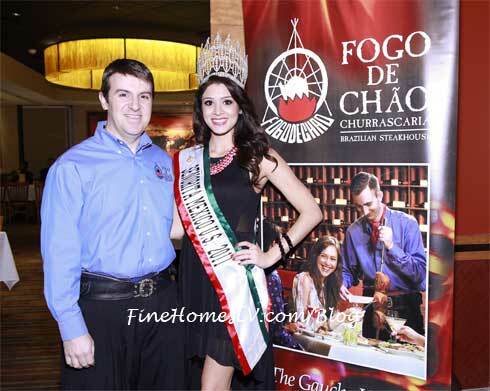 Señorita Mexico US, a division of Miss Mexico, 15 beauty pageant contestants dined at Fogo de Chão Brazilian Steakhouse on Wednesday. 53 Miss America’s Outstanding Teens from around the country explored Wayne Newton’s Casa de Shenandoah Ranch, the iconic entertainer’s 42-acre property and highly anticipated Las Vegas attraction. The Wayne Newton Museum sponsored the ladies’ visit for the day while in town for the Miss America pageant by providing lunch, transportation and a sneak peek at the famed estate.